Yes, yes, y’all! And you don’t stop! 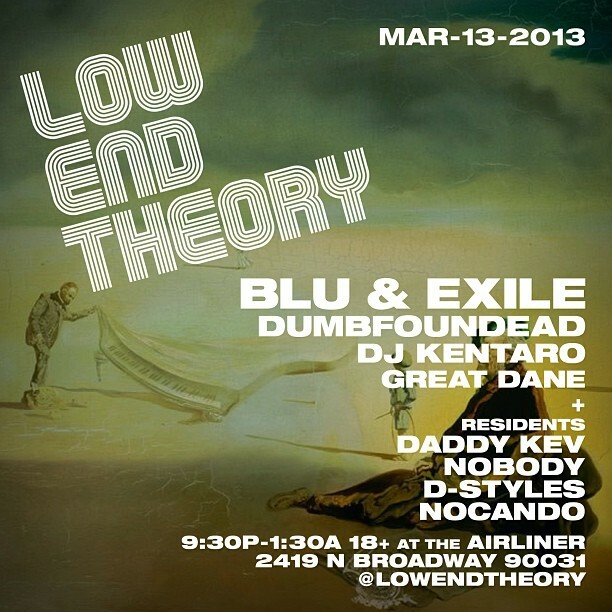 Tonight at 09:30pm, Low End Theory LA brings to you one of the dopest line-ups of independent hip hop music – Blu & Exile, Dumbfoundead, DJ Kentaro and Great Dane. If there’s one way you want to celebrate the end of winter, then it’s got to be at the The Airliner. Come early because it will be packed!!! Entrance is Free with a Canned Good. As the holidays approach, weather gets colder, even more is in need. Lets do what we can as a music community to let our vibrations be heard. Please bring at least 1 canned good to donate to the cause. L O S – A N G E L E S (#19)Beat Swap Meet is a celebration of vinyl culture. It’s a history lesson for present day truth seekers, a gathering of the minds. Over 45 Invited Record Collectors & Dealers from all over the West Coast, Buy Sell & Trade: Blues, Funk, Hip Hop, Jazz, Latin, New Wave, Psych, Punk, Rap, Reggae, Rock, Soul, and World 12′s LP’s & 45′s on VINYL. 6 Music Areas + DJ’s spin rare selections from their record collections + Producers & Bands Perform Live + B-boys & B-girls Get Free + Open Cut Session + Dozens of music related vendors selling Clothing, Art, Handmade Jewelry, & more. DJ sets by: Abel, AC The PD, Analog, Carmen, Charlie Rock, Curse, Darrell D, Filiblunt, Funk Freaks, Gabe Real, The Handroidz, Inform, Issue, Jawa, Kiwamu Omae, K Ozz, Listen Recovery, Lu-Man, Lord Ron, Lotus Pedal, Lu-Man, Mean Mr. Mustard, Millhouse, 671, Supa Kay, Tasko, Thirdrail, & others TBA. Beat Club Co-Op, Delicious Vinyl, The Deuce, Fire Foxiness, Good Life Roots, Graffroots, Hip Hop Philosophy, Ill Street Blues, Listen Clothing, Los Undergods Mexicanos, Mind Funk, Mix and Blend, Mixwell, Native Sol, Raw Kulture, Sticky Rick’s, 2nd Wnd, Stokyo, Ubiquity Records, Woven Culture, and many others. Youtube commercial for DJ D-Styles‘ mix CD SUKEBE. Check your local record shops for availability.